Allergy Buyers Club has a wide selection of products to make your home just a little bit healthier! They offer air purifiers, steam cleaners, water filters & so much more! 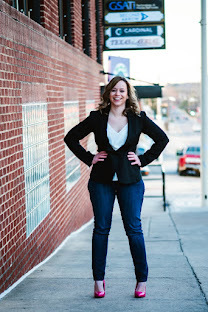 After browsing online, for a mattress pad, I was excited to see that Allergy Buyers Club offered one with more features than I could of imagined in a pillowtop pad! My bed is only a few years old but it just isn't as comfortable as it was when I first bought it, most nights I spend tossing, turning & I just have a hard time getting comfortable. I'm not ready to purchase a new bed but excitedly, some adjustments have been made! Thanks to Allergy Buyers Club, I would soon have a brand new mattress pad to help me finally get a good nights rest! 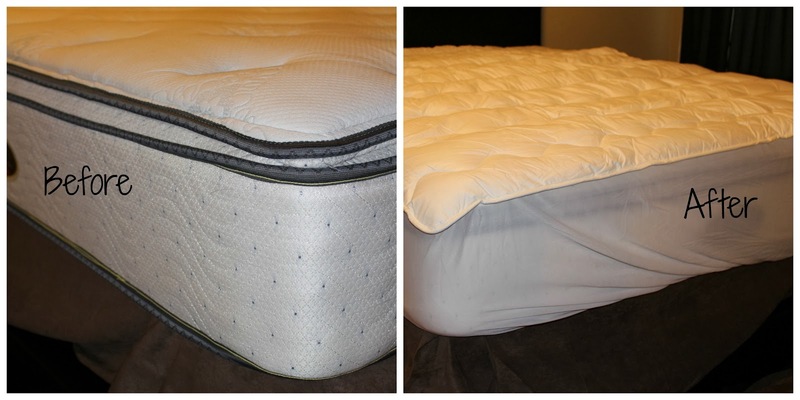 The White Mountain Textiles Pillowtop Mattress Pad is hypoallergenic & features a deluxe cotton-top pillowtop pad with a 2-inch cushioning layer & it's contoured quilting keeps fill evenly distributed, the 100% cotton fitted skirt fits mattress up to 18 inches think & the hollow fiber fill allows better air circulation to prevent heat build-up & perspiration. Who knew a mattress pad could do all of that? Did I mention it's machine washable? It's ultra durable & is able to withstand multiple washings without becoming lumpy, flat or falling apart! I've been sleeping on my new pillowtop mattress pad for a few nights now & wow what a difference, not only have I been sleeping better but my bed is so comfortable, I don't ever want to leave it! Available in twin, full, queen & king sizes, everyone in your home will want their very own White Mountain Textile Pillowtop Mattress Pad after trying it out, my son really loves mine as well & I think I might have to get one for his bed! Look at that, doesn't it just scream comfort!? After a long day, climbing into my bed & relaxing on my new pillowtop is exactly what I need! Buy it: Purchase the White Mountain Textiles Pillowtop Mattress Pad online at Allergy Buyers Club starting at $129.95! 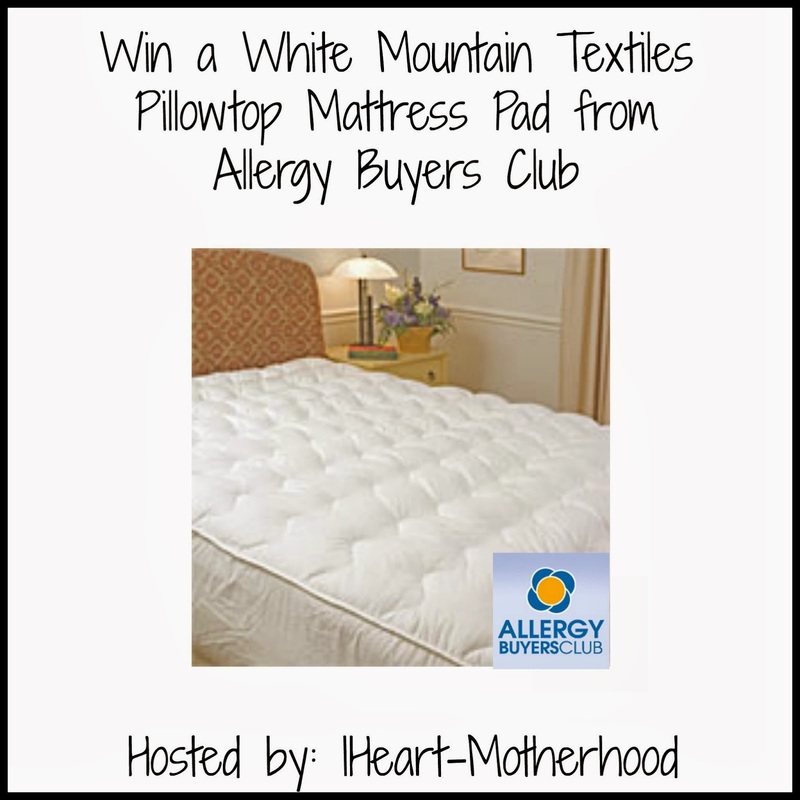 Win it: One lucky reader will win the White Mountain Textiles Pillowtop Mattress Pad in their choice of size! This giveaway is open the US only, ages 18 & up. Ends on 2/17/14 at 11:59 PM EST. Enter using the Giveaway Tools form below. Good Luck! Disclosure: IHeart-Motherhood is not responsible for prize fulfillment. Allergy Buyers Club is providing the product and not running the giveaway. I'd like to own the Danby Premiere 70 Pint Dehumidifiers. I would love to have the Sandmahn Memory Foam Mattress with Foundation! Talk about good sleep! If I could afford it, I would love to have the Reliable EnviroMate TANDEM EV1 Steam Vacuum Cleaners. My carpets get so dirty with the dog and this would help. I love their Air O Swiss 7144 Ultrasonic Humidifier for bringing moisture in the air during the very dry winter season! Thank you! I'd love to own the Sienna Luna Plus Steam Cleaner and Mop. I would love to own the compact plus air purifier. I would love to own the AquaCera HCS Stainless Steel Countertop Water Filter with CeraMetix™ Filter. Reliable Enviromate Tandem EV1 Steam Vacuum Cleaners!!! They sound awesome and I need a GOOD steamer for my carpets!!! Thanks for the post and giveaway!!! I would love to own the Yala Silk Habotai Comforter Cover! They carry some amazing items! IQAir New Edition HealthPro and HealthPro Plus Air Purifier. I like the Dyson DC39 multipurpose vacuum cleaner! I'd like to get the IQAir Air purifier. I'd like the Envirosept Electronic Furnace Filter Air Cleaner System to install in our furnace. The Sienna Luna Plus Steam Cleaner and Mop looks extremely handy and useful! I'd love to own the Miele S6270 Onyx Canister Vacuum Cleaner! I would love to try the hypodown 800 fill down pillow. Vapamore MR50 Steam Vacuum Cleaner. Would be GREAT for using in my car after the pet walks his muddy paws all over everything, and the kiddo has ground crumbs and crime into everything else! I would very musc like to own the Dyson DC41 Animal Vacuum Cleaner. The cool mist console humidifier, I need a mattress protector too. Thanks for the chance!! I would love to own one of their air purifiers!! I'd like the Yala Silk Fleece Blankets.